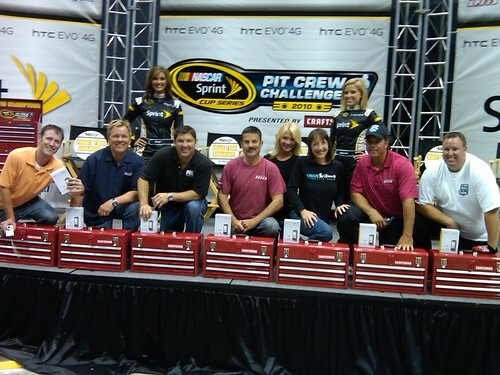 Posted by claireblang in 2009 Season, Crew Chiefs, Teams. OMG – Evernham’s New Office Crib!! Today (Tuesday, January 27) I went to Ray Evernham Enterprises for a special lunch with Ray as he announced his new course for his future. 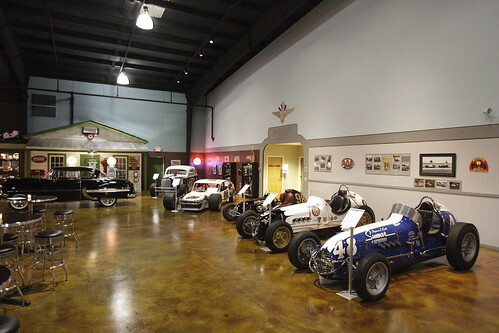 I was blown away by the museum Evernham has put together at his new museum/shop just off exit 36 on I 77 North. (See the amazing picture). “We know how rough the road will be – How heavy here the load will be. We know about the barricades that wait along the track. I got goose bumps on that one. Each member of the teams signature is etched below the saying and it’s hard to believe that one group of young men could be as committed to winning and excellence as that team. But you’ll have that in NASCAR Sprint Cup Series racing and you could almost feel the passion given in the prime years of the guys on that team led by Evernham to being number one. Today, Evernham is happy and doing things on his terms. It’s not time for champion crew chief Chad Knaus to stop and enjoy what he has built and achieved – he’s still on his game, Evernham said. One day Evernham may return to Sprint Cup racing – but today it’s Evernham’s turn to reflect, collect and share with young racers and up and comers and whomever the heck he wants to share his knowledge with. He’ll help set the land speed record, He’ll create racing opportunities for young stars, host on ESPN, serve as new owner of East Lincoln Speedway and continue to build the museum at REE. The place was incredible -beyond description. Inside the building, a diner, an antique Texaco gas station store front, bar, and the vehicles…amazing. Check out the photo at right. Impressive Ray! I want to thank Randy Rodriguez the Sprint Cup Series hauler driver for Robby Gordon Motorsports for calling me the first week of January from the Dakar rally when I was on the air on Sirius NASCAR Radio. Not everyone knows that Randy is married to Robby’s mom and he’s a right guy. I received a phone call as clear as talking to your neighbor and here it was a call from Randy in Argentina. What a story! He talked about the guys, including Robby sleeping in tents, and roll overs and near misses and the crowds that lined the streets and the throngs that welcomed them to South America. His story was so compelling. Once Rodriquez and the team returned he sent me some photos of the trip – (see the photos in the blog sidebar to the right). Enjoy! Rodriguez is a man of his word. He said he would call and he did – he had a special international cell phone and it was a real special surprise to be able to take my listeners LIVE to the Dakar Rally camp of Gordon’s team. Thanks Randy!! Stay tuned for more excitement and unpredictable calls and inside stories on Dialed In. I am going to begin posting regular for the season as I leave for Daytona and coverage of the 2009 Daytona 500. Posted by claireblang in Breaking News, Crew Chiefs, Teams. on their race car this morning in the garage – and some folks thought they saw a motor change. They are not changing a motor – I walked into the garage a few minutes ago to check with crew chief Alan Gustafson…. CBL: It looked as if you were changing a motor but you are not, correct? It’s amazing how on top of things the race fans are. Great job to those of you who asked about this today. Posted by claireblang in Breaking News, Crew Chiefs, NASCAR. I just talked with Tony Eury Junior – He is leaving DEI before the end of the season to go to Hendrick Motorsports. CBL: Is it true you’re leaving early? Eury Junior confirmed that he’s going to take four guys from his team as I reported to you earlier this week. CBL: Will Dale Junior test early (for HMS) or run a Busch car for Hendrick this year? He probably won’t run any Busch races. We have talked about testing some. Ah, we don’t need to cause any problems. If it will help Regan can drive his car at Atlanta and if we can drive their car then that’s what we’ll do. We’ll do a lot of our winter testing at Kentucky I am sure in November and December but we’re not going to push the envelope too bad to create any more problems than’s already out there.